. Slender-billed white-breasted nuthatch (photo by Rod Gilbert). White-breasted nuthatches are a common small passerine of deciduous forest in much of North America. The slender-billed subspecies (Figures 1, 3) is restricted to parts of western Washington, western Oregon, California, and extreme northern Baja (AOU 1957). It has a slimmer bill, is smaller, and has buffier underparts than the much more common subspecies (S. c. tenuissima) present in eastern Washington. Genetic analyses indicate that slender-billed white-breasted nuthatches are genetically distinct from other populations in North America, but also demonstrate significant genetic differentiation among populations within this subspecies (Spellman and Klicka 2007). White-breasted nuthatches, including the slender-billed subspecies, are weak cavity excavators and therefore most often use naturally occurring cavities in living trees for roosting and nesting. Cavities made by woodpeckers and nest boxes are also occasionally occupied (Wilson et al. 1991,Viste- Sparkman 2006). Individuals use multiple cavities during the year (Gumtow-Farrior 1991). In Washington and Oregon, slender-billed white- breasted nuthatches are commonly associated with Oregon white oak (Chappell 2005, Hagar 2006), as well as black cottonwood and Oregon ash (R. Hill, pers. comm.). Nuthatch densities are greater in areas with higher numbers of large trees, which provide more surface area for foraging and have more natural cavities for nesting and roosting (Hagar and Stern 2001, Viste-Sparkman 2006). Large open-grown oaks in woodlands with sparse understories are particularly important as habitat because these trees have more cavities and foraging substrate than oaks grown in densely vegetated habitats. Birds are therefore more abundant in smaller (<12 ha, 30 ac) woodland patches, which by definition have more edge, than in larger (>25 ha, 62 ac) patches (Viste- Sparkman 2006). In Oregon’s Willamette Valley, oaks with nests average 70 cm (27.5 in) in diameter (Viste-Sparkman 2006). Pairs establish territories of about 10-15 ha (25-37 ac) and occupy the same territories year-round (Pravosudov and Grubb 1993, Hagar 2006). Foraging typically occurs on the trunk and larger limbs of trees. Fissured bark, which occurs more on larger trees, supports a greater abundance and diversity of arthropods than smooth bark. In the Willamette Valley, weevils and earwigs are important parts of the diet during breeding and post-breeding periods, with variation in the diet decreasing in winter (Anderson 1976). Slender- billed white-breasted nuthatches also often feed on acorns during winter, and large oaks produce more acorns (Peter and Harrington 2002). Distribution and population trends. Slender-billed white-breasted nuthatches remain somewhat common and widespread in lowland areas of Clark County, with numbers appearing to be highest in the vicinity of Ridgefield National Wildlife Refuge (Figure 2; eBird reports; Chappell 2005; R. Hill, pers. comm.). Population trend in the county is unknown. Birds in this population make extensive use of ashes, cottonwoods, and oaks. The population is probably an extension of the broader population ranging through the Williamette Valley north to Sauvie Island in Oregon. Birds occurred in the area between Woodland and Kalama in Cowlitz County from 1985-1995, but breeding season records have become rare there and no observations of nesting have been made in recent years (Altman 2011). The subspecies was reportedly once most abundant in the oak/prairie areas of Pierce and Thurston counties (Bowles 1929, Kitchin 1934, Jewett et al. 1953), but did not breed north of Seattle or in the San Juan Islands (Chappell 2005, Altman 2011). The population in South Puget Sound declined greatly by the early 20th century (Dawson and Bowles 1909, Bowles 1929, Kitchin 1934), although birds were still common in south Tacoma and regularly occurred on Joint Base Lewis-McChord in the mid-1960s (Altman 2011). Further decreases took place in Pierce County in the 1980s, when the last nine breeding sites disappeared; the last reported sighting during the breeding season was in 1998 and the subspecies is now considered extirpated in this region (Chappell 2005, Altman 2011). Factors affecting populations. Oregon white oak-prairie habitats were once far more widespread in South Puget Sound, but have experienced dramatic declines and are among the most threatened habitats in the Pacific Northwest (Hanna and Dunn 1997, ABC 2006). Factors contributing to their loss or degradation include urban, residential, and rural development; harvest of oak trees; conversion to agriculture; fire suppression and associated encroachment by conifers; conversion of oak woodland and forest to conifer stands for timber production; and lack of oak recruitment (Hanna and Dunn 1997, Altman 2011). 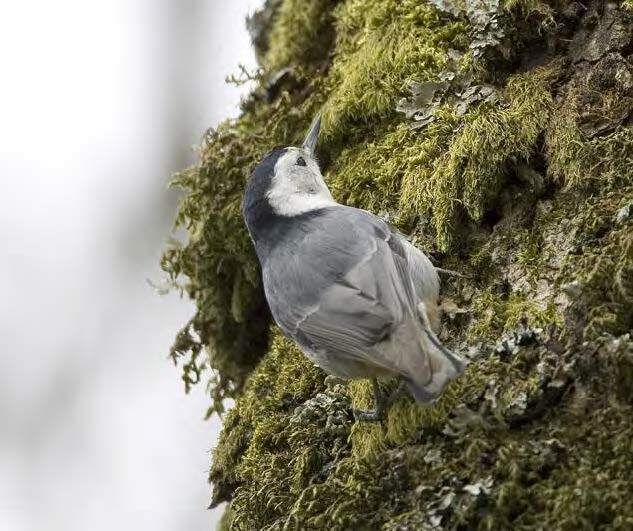 The decrease of oak habitats has likely been the main cause of the decline and extirpation of slender-billed white-breasted nuthatches from the South Puget Sound lowlands (Altman 2011). Other contributing factors may include scarcity of nesting cavities, competition from starlings for nest sites, insufficient oak mast to support overwintering populations, genetic drift due to small isolated populations, and unknown disease or natural disturbance (Chappell 2005). Conservation actions. 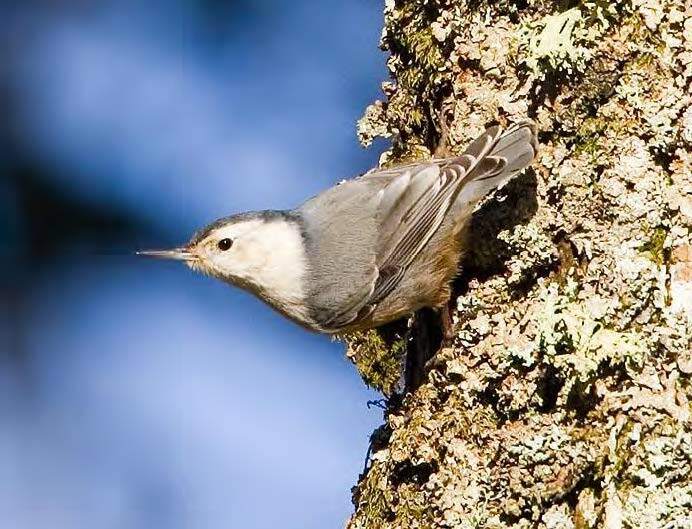 Conservationists have long been aware of the importance of preserving oak communities and their associated wildlife, including slender-billed white-breasted nuthatches, in the Pacific Northwest. Numerous habitat management and restoration projects have been undertaken (e.g., Hanna and Dunn 1997, Devine and Harrington 2004, Dunwiddie and Bakker 2011), although replacing the large oaks that were present historically will require many decades. WDFW developed Priority Habitat and Species (PHS) management recommendations for oak woodlands (Larsen and Morgan 1998), and many other management plans, recommendations, and landowner guides have been published for this habitat (e.g., Columbia Gorge Audubon Society 1991, Vesely et al. 2004, Harrington and Devine 2006, Altman and Stephens 2012). Based on the findings of a feasibility assessment (Slater and Altman 2012), a cooperative project was initiated in 2012 by the Ecostudies Institute, American Bird Conservancy, and Joint Base Lewis-McChord to reintroduce a population of slender-billed white-breasted nuthatches into South Puget Sound. The assessment determined that adequate oak woodland existed in the region to support a population of more than 300 birds. This work is planned for 2013 using 4-10 pairs of nuthatches from western Oregon (Slater and Altman 2012). Partners and cooperators. American Bird Conservancy, Joint Base Lewis-McChord, Ecostudies Institute, Center for Natural Land Management, U.S. Fish and Wildlife Service. ABC (American Bird Conservancy). 2006. Top 20 most threatened bird habitats in the United States: oak savannah. Bird Conservation 2006 (summer):12-13. Altman, B. and J. L. Stephens. 2012. Land manager’s guide to bird habitat and populations in oak ecosystems of the Pacific Northwest. American Bird Conservancy, The Plains, Virginia, and Klamath Bird Observatory, Ashland, Oregon. 82 pp. Anderson, S. H. 1976. Comparative food habits of Oregon nuthatches. Northwest Science 50:213-221. AOU (American Ornithologists’ Union). 1957. Check-list of North American birds. 5th edition. American Ornithologists’ Union, Washington, D.C.
Bowles, J. H. 1929. Changes in bird populations. Murrelet 10:52-55. Chappell, C. B. 2005. White-breasted nuthatch. Pages 280-281 in T. R. Wahl, B. Tweit, and S. G. Mlodinow, editors. Birds of Washington: status and distribution. University of Washington Press, Seattle, Washington. Columbia Gorge Audubon Society. 1991. Washington oak habitat: a plan for managing the oak forests of Washington State. 36 pp. Dawson, W. L. and J. H. Bowles. 1909. The birds of Washington. 2 volumes. Occidental Publishing Company, Seattle, Washington. Devine, W. and C. Harrington. 2004. Garry oak woodland restoration in the Puget Sound Region: releasing oaks from overtopping conifers and establishing oak seedlings. 16th International Conference of the Society for Ecological Restoration, Victoria, British Columbia. Gumtow-Farrior, D. L. 1991. Cavity resources in Oregon white oak and Douglas-fir stands in the mid-Willamette Valley, Oregon. M.S. thesis, Oregon State University, Corvallis, Oregon. Hagar, J. 2006. White-breasted nuthatch (Sitta carolinensis). Pages 449-451 in D. B. Marshall, M. G. Hunter, and A.
L. Contreras, editors. Birds of Oregon: a general reference. Oregon State University Press, Corvallis, Oregon. Hagar, J. C. and M. A. Stern. 2001. Avifauna in oak woodlands of the Willamette Valley, Oregon. Northwestern Naturalist 82:12-25. Hanna, I. and P. Dunn. 1997. Restoration goals for Oregon white oak habitats in the South Puget Sound region. Pages 231-245 in P. Dunn and K. Ewing, editors. 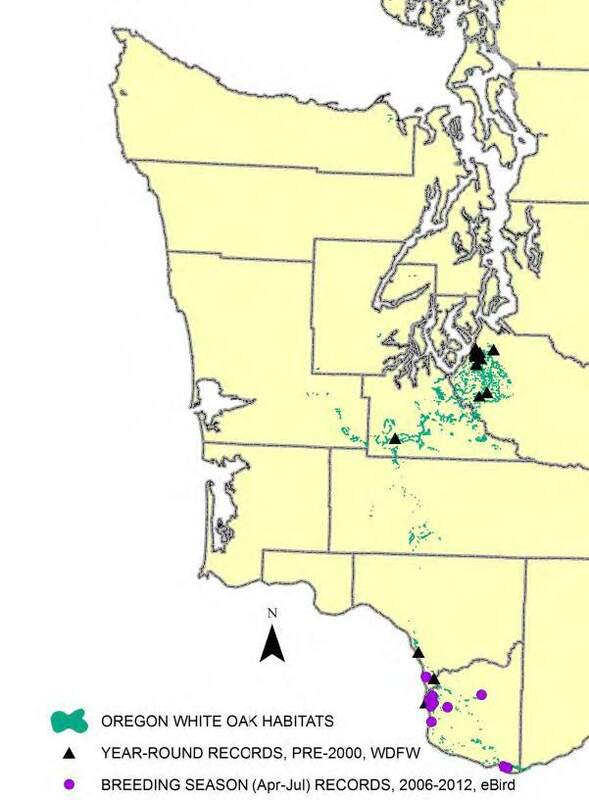 Ecology and conservation of the South Puget Sound prairie landscape. The Nature Conservancy, Seattle, Washington. Harrington, C. A. and W. D. Devine. 2006. A practical guide to oak release. General Technical Report PNW-GTR- 666, Pacific Northwest Research Station, USDA Forest Service, Portland, Oregon. Kitchin, E. A. 1934. Distributional check-list of the birds of the state of Washington. Northwest Fauna Series Number 1:1-28. Pacific Northwest Bird and Mammal Society, Seattle, Washington. Larsen, E. M. and J. T. Morgan. 1998. Management recommendations for Washington’s priority habitats: Oregon white oak woodlands. Washington Department of Fish and Wildlife, Olympia, Washington. 37 pp. Peter, D. and C. Harrington. 2002. Site and tree factors in Oregon white oak acorn production in western Washington and Oregon. Northwest Science 76:189-201. Pravosudov, V. V. and T. C. Grubb, Jr. 1993. White-breasted nuthatch (Sitta carolinensis). Birds of North America No. 54. The Birds of North America, Inc., Philadelphia, Pennsylvania. 44 pp. Slater, G. and B. Altman. 2012. Reintroduction of the slender-billed white-breasted nuthatch to its former breeding range in South Puget Sound. Project proposal. 8 pp. Spellman, G. M. and J. Klicka. 2007. Phylogeography of the white-breasted nuthatch (Sitta carolinensis): diversification in North American pine and oak woodlands. Molecular Ecology 16:1729-1740. Vesely, D., G. Tucker, and R. O’Keefe. 2004. A landowner’s guide for restoring and managing Oregon white oak habitats. Bureau of Land Management, USDA Forest Service, Oregon Department of Forestry, and The Nature Conservancy. 65 pp. Viste-Sparkman, K. 2006. White-breasted nuthatch density and nesting ecology in oak woodlands of the Willamette Valley, Oregon. M.S. thesis, Oregon State University, Corvallis, Oregon. Wilson, R. A., P. Manley, and B. R. Noon. 1991. Covariance patterns among birds and vegetation in a California oak woodland. Pages 126-135 in R. B. Standiford, technical coordinator. Proceedings of the symposium on oak woodlands and hardwood rangeland management. USDA Forest Service General Technical Report PSW-126, Berkeley, California.